1-CD-Album DigiPac (4-plated) with 24-page booklet, 20 tracks. Playing time: 52:02. Their second album, adequately enhanced. 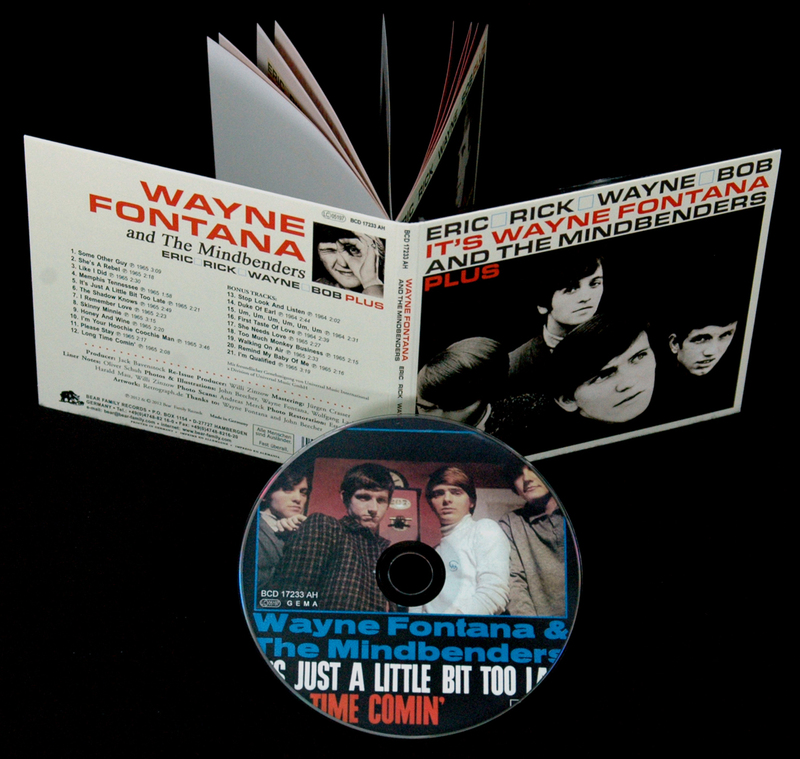 It includes nine Fontana/UK bonus tracks, the hard to come by Pomus/Spector single B-side First Taste Of Love and the even more rare 'Walking On Air'-EP (1965). This CD also includes the Top 20 smash It's Just A Little Bit Too Late, and it features Eric Stewart on guitar (later of Hotlegs and 10cc fame). Songs by Burt Bacharach, Goffin/King, Leiber/Stoller, Chuck Berry and others, and a booklet with many photos and the band history. Only very few bands have a new album out though in the meantime they have ceased to exist, with new products of the individual musicians already in the shops. 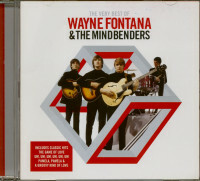 That's exactly what happened with the second album by Wayne Fontana & The Mindbenders. There was no chance to promote the record and, hence, no chart entrances were on the horizon. A real shame as this reissue shows. The album is packed with versatility, power and sensitivity. 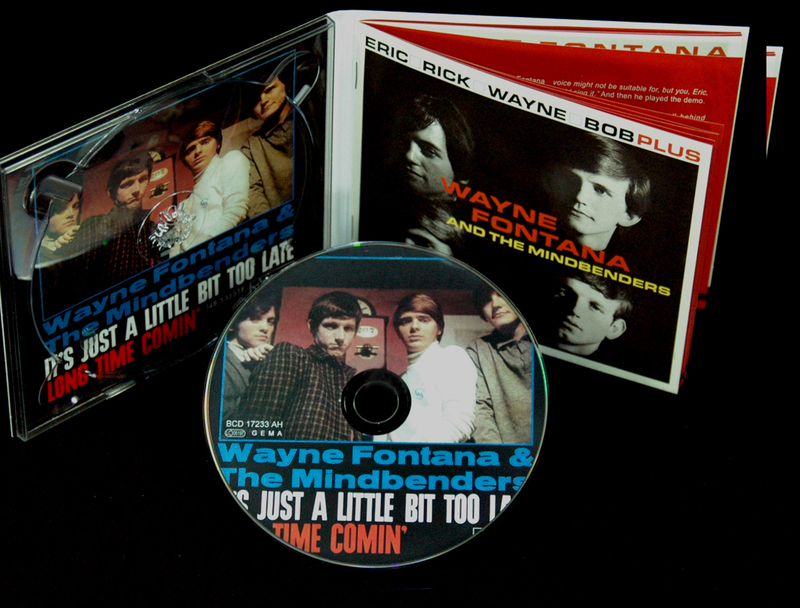 Cover versions by Gene Pitney, Willie Dixon among others get the unique Mindbenders treatment - and Wayne Fontana's interpretation of Van McCoy's I Remember Love is a smash. 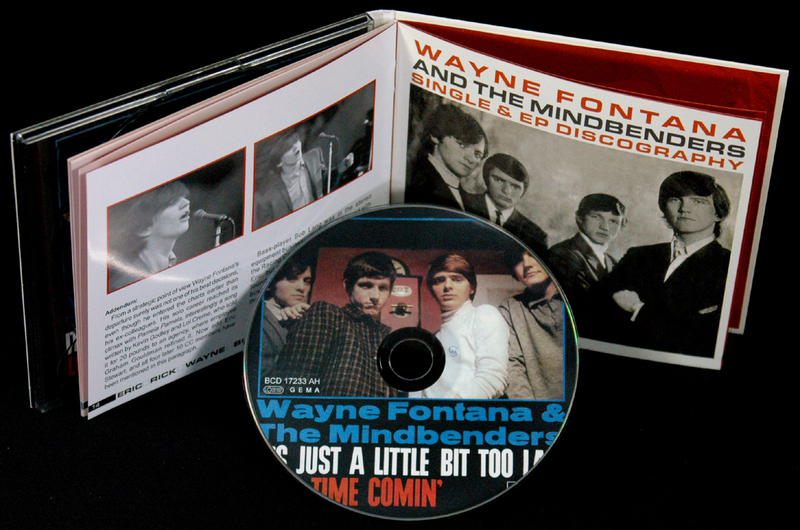 The fetching booklet includes many photos and documents the second half of the band's career. 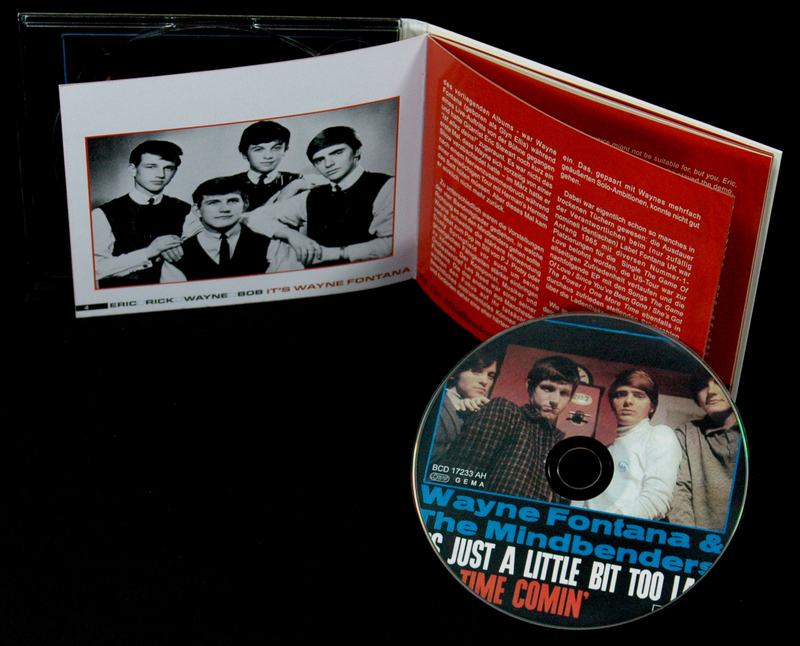 The CD includes nine extras: rare 1964/65 single B-sides and their last EP, 'Walking On Air', which is sought-after by collectors these days. 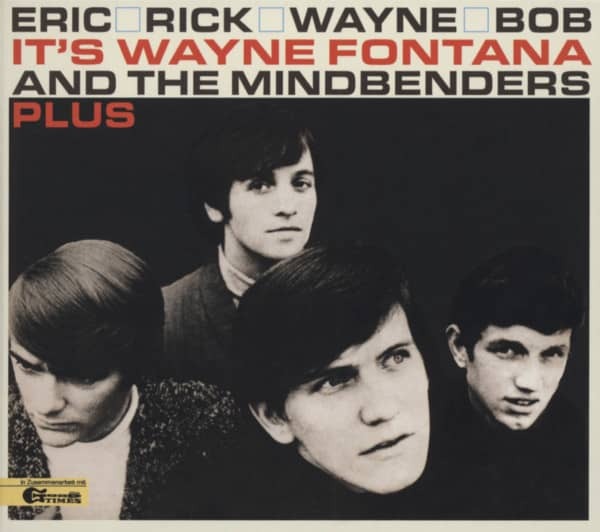 "Wayne Fontana And The Mindbenders"
On the LP cover back of the album'Eric Rick Wayne Bob', released in January 1966, it says: "Wayne and the Mindbenders simply refuse to fall into the comfortable professional groove. They are not resting on the successes of the past, and they have some of them. They want to make progress to prove to any cynical doubter that they have the ability to hold their own in show business for a very, very long time." When the album was released, Wayne Fontana and the Mindbenders were already divorced people. They always had that ability. But the enthusiasm of the band from Manchester, which producer Jack Baverstock praised so exuberantly on the 1965 debut album'The Game Of Love', was gone. Already in October of the same year - three months before the release of this album - Wayne Fontana (born as Glyn Ellis) had left the stage during a live performance and guitarist Eric Stewart briefly glanced at a "Is everything yours! It wasn't the first time Wayne had left a show prematurely - in March, after a nervous breakdown during a three-week tour with Herman's Hermits, he had to stay in bed. But this time he really didn't come back. The ideas of the four band members were too different as to which direction the Mindbenders should take. Wayne had in mind a stronger shift from beat to pop in the style of P.J. Proby or Dusty Springfield, also in order to be able to bring in his vocal abilities more strongly. The composer, musician and orchestra chief Les Reed was one of his fixed stars. The other three from Manchester wanted to focus on their truly remarkable instrumental skills and therefore demanded a rather harder pace. This, coupled with Wayne's repeated solo ambitions, couldn't go well. Actually, many things had already been in dry cloths: the perseverance of those responsible at (only coincidentally nominally identical) label Fontana UK was rewarded in early 1965 with various number one placings for the single The Game Of Love, the US tour went well and the following EP with the songs The Game Of Love / Since You've Been Gone / She's Got The Power / One More Time was also sold in quite satisfactory numbers. As so often, it was the pressure to stay on top after the ascent, and this has always been tied to single listings. The obvious idea of betting on the same horse again and using another Cliff Ballard Jr. number, as in The Game Of Love, proved to be less than happy. It's Just A Little Bit Too Late only made it into the top 20 in England and did not exceed 45th place in the USA. The follow-up single She Needs Love - also written by Ballard jr. - as well as the'Walking On Air'-EP fared even worse. The band ran out of air. Nevertheless: In the meantime the'Eric Rick Wayne Bob' album had been recorded piece by piece. It shows once again the versatility, strength and sensitivity of the group. 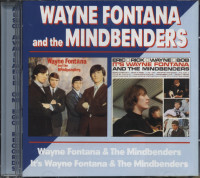 Whether composed by Gene Pitney or Willie Dixon - each song got its characteristic Mindbenders treatment. Drummer Rick Rothwell let off steam on Skinny Minnie, while Eric Stewart delivered a wild adaptation of I'm Your Hoochie Coochie Man. 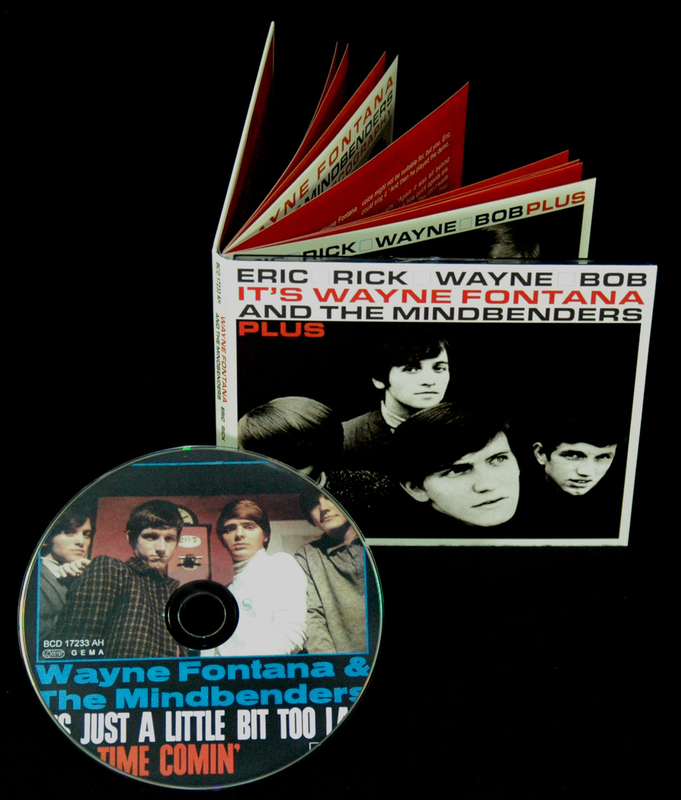 And the vocal performance of Wayne Fontana on Van McCoy's I Remember Love is one of his most outstanding from the Mindbenders-era. 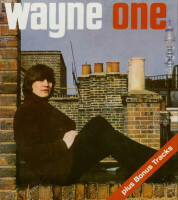 Back to Wayne's early departure during the last joint performance: Eric Stewart took over the microphone and the concert was completed in threes. The audience liked it, of course in ignorance of the fact that a band had just broken up and a new one had been born at the same time. Wayne: "Eric has always asserted his opinion quite vehemently, and he must always be right, like a dictator. He picked the songs, and when I wanted to sing others, it was always "No, take this one, take that one!" I got sick of it and I said,'Here, take it. "I'm out of here." Customer evaluation for "Eric, Rick, Wayne, Bob, Plus"